This is an official entry to Dainty Mom's guest post challenge on "How to Find the Time to Write or Blog." Even if I am at home most of the time, I find it hard to have a "me" time especially that I am exclusively breastfeeding my baby. As we all know it, taking on a mommy job requires so much responsibility and time. You won't be able to master the drift in one sitting or mere researching. We eventually get used to it as we go along with our daily routines, getting in tune with the various situations, and learning from our hits and misses. We gain credibility from our own personal experience. I am a hands-on mom to my seven months old baby and I'm loving it. Although it's quite exhaustive at times but once I see my child hitting her milestones, all my efforts and sleepless nights are paid off. My love for Baby A grows deeper each day especially now that she is learning to respond by babbling and smiling back to us. One time, both me and the yaya tried to extend our arms to baby to see whom she would follow. And to my surprise, she chose me to carry her! That moment made my heart jumped out with joy. She can already recognize people. 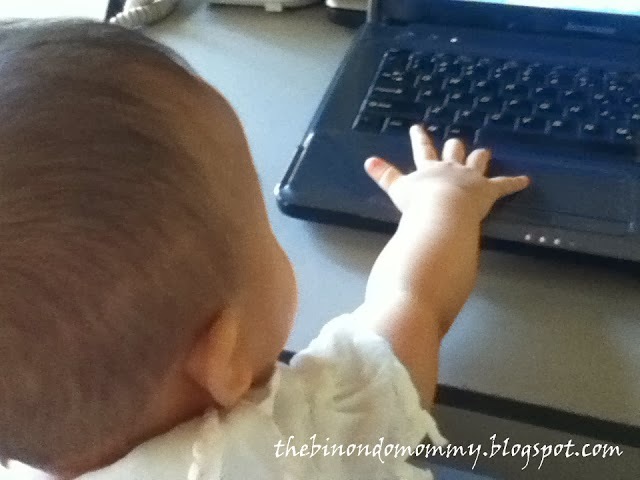 This little baby wants to blog too! Entering into this Motherhood phase brings about so much emotions and drama to our life. Aside from the photos and videos I have been taking day by day, another way to better document this wonderful memories is through blogging. However, blogging needs a certain amount of time, a "me" time, to be able to compose a cohesive blog post. I am a newbie mom blogger and here is how I find time to write for my blog. Getting familiarize with my mommy routines enabled me to identify when I could set a time for blogging and other online activities. The key here is to stick to a certain schedule. Even if it's not yet my "me" time, I have started to mull over the topics and stories that I wanted to write about. Waiting time or idle time for me is when riding an LRT, on a jeepney, inside the car, taking a bath, while eating, while pumping, while direct feeding or just before I fall asleep. I jot down keywords into a piece of paper, notebook or type them on my cellphone for me to look back during my "me" time. I just keep my thoughts and ideas flowing at any time of the day. Moms are good at multi-tasking. Despite my busy schedule as a work-at-home mom (WAHM), I challenge myself to compose at least one blog post a week or four posts a month for now. It made me feel good and proud every time I am able to publish a blog post because I know I used up my precious time in doing it. This way, I will be sure that I find time to write even if it means being grounded at home.